I am about to mail off a ring bearer pillow and flower girl basket. and this flower girl basket for a wonderful young lady who is getting married soon! We met at church quite a few years ago and when she contacted me about doing something like this, I was very excited to say yes, I can help. It’s my little gift to her and I pray that her wedding day is just amazing and that her, her fiance, and their son have a wonderful and blessed life together! Ring Bearer Pillow– I cut 4 pieces of 8.5″ by 8.5″ pieces of chosen fabric. I doubled up each side as the material was thin and would show the stuffing. I placed two down, right side facing up, then placed the next two on top, wrong side facing up. Then I sewed around leaving an opening to turn right side out. I did that, then stuffed the pillow with stuffing, and sewed the opening shut. I then made two layers of ruffles to go on the top. I then wrapped around a piece of fabric that I had sewn together, making sure the seam was underneath and couldn’t be seen. That piece met in the top middle where it would be covered by the starfish. I used fabric glue to hold the ruffles, middle piece, and starfish in place. 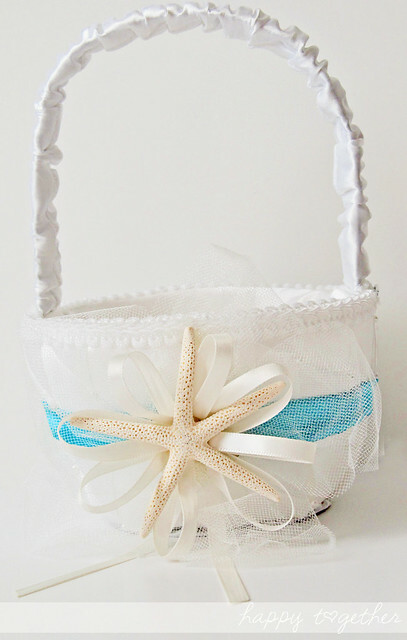 Flower girl basket– I found this basked on sale and took off some of the accessories that were on it. Then I added some fabric that was the same as the ruffles on the pillow. 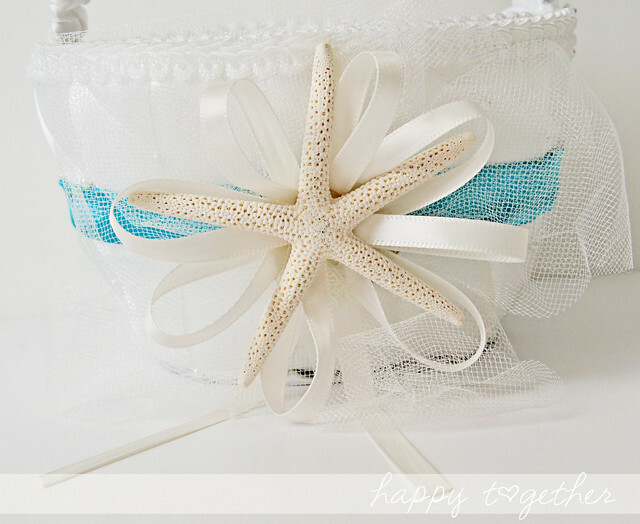 Where this part meets in the middle is where I glued looped pieces of tulle, ribbon, and the starfish. I used a hot glue gun for this piece. Gorgeous colour combo. 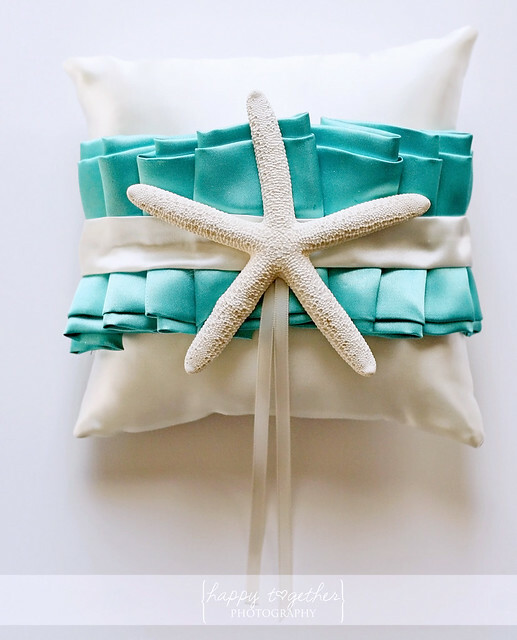 The ring bearers pillow looks stunning (makes me want one)- and I love the starfish on both! oh my word! could those be anymore amazing. you rocked it. 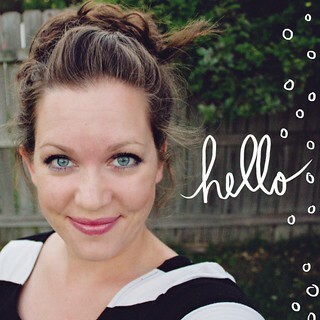 You are so creative – I love these and know your friend will as well. The ring bearer pillow literally jumped off the page in Google Reader. The color combination is so striking. What a lucky bride to have such beautiful things to be part of her wedding day. 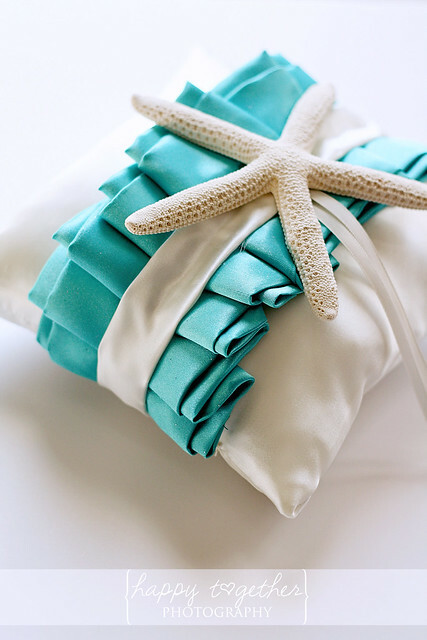 Beach with white and teal theme – bet it will be a very pretty wedding.